Jim Sherck, a member of Sandusky County Citizens for Affordable Healthcare, wrote the following letter to the editor, published in the Toledo Blade on July 2. His story is a good one to ponder this week as the Ohio General Assembly decides whether or not to freeze Medicaid expansion in Ohio. Note that the story he tells takes place in Florida, a state that does not have Medicaid expansion. Let’s not bring the hopelessness he describes back to Ohio! Call Rep. Reineke and Sen. Burke (800-282-0253) today and tell them to protect our Medicaid expansion. No veto override. I am a retired judge who served 23 years at both the trial and appellate court level. During my judicial career, I witnessed a great deal of human misery. Nothing in the judicial system, however, prepared me for what I saw when I recently ended up in a Lehigh Acres, Fla., urgent care center. Every few minutes, someone would come in the door. The receptionist would ask if the person had an insurance card. If the person did, he was told to have a seat and fill out the questionnaire. If he did not, he was told no service could be provided, and he would have to vacate the premises. The majority had no insurance. They simply were told to leave. Those people who were told to leave just turned around and left. There was no argument, no questioning, and no expression of anger. Many of these folks had their spouses with them; some had small children. Most were obviously in great pain. Many exhibited limited physical mobility. But they all had one thing in common: You looked at their faces and everything had been sucked out of them. There were no discernible facial effects. They had no hope, no joy, no prospects. They were empty. This is America. How can we allow this to happen? Now, Congress wants to eliminate health coverage for millions of Americans who currently have coverage. If you agree that health care is a human right, and this is a moral issue, then make your views known to Sen. Rob Portman now. Mark Brown participated in our June 28, 2017 “Stop Trumpcare” Protest in Fremont, cosponsored by Sandusky Citizens for Affordable Healthcare. I want to write about Expanded Medicaid and how it means more money for you if you want money. I’ll write about what happened to me personally first, then how Expansion has positively affected the economy of Fremont, Ohio, as an example of many areas in the nation. After that, I’ll discuss the how some legislators want to stop putting money into our local economy. I’m employed full time, but still qualify for Expanded Medicaid. I was recently diagnosed with a disorder that prevented my blood from clotting. In simplest terms, my immune system was eating the things that clot my blood if needed. I was in the hospital from Wednesday night, June 21 until Saturday afternoon, June 24. In that time, not only did I employ multiple physicians and nurses, but also four different laboratory technicians, a compounding pharmacist, multiple food service personnel, multiple office workers and custodians and at least one gift shop attendant. That’s who I know about. A shout out to those friends and relations who work at the various stores, factories and services where those employees will spend their pay. Before Expansion, people in my income level didn’t go to the doctor until they had no other choice. It took us away from earning the money we need to keep our houses and feed ourselves and it cost money we still don’t have. Because we didn’t go to the doctor often until it was very late, more patients died than should have, and the ones that survived often still just plain didn’t have the money to pay. Reimbursement to the E.R.s we’d end up in, if we went at all, was about 55% of the bill. Since Expansion, not only have reimbursements gone up to over 90%, but people are seeking treatment sooner and more often. Healthcare systems now have cash to build and upgrade their facilities and have been doing so. 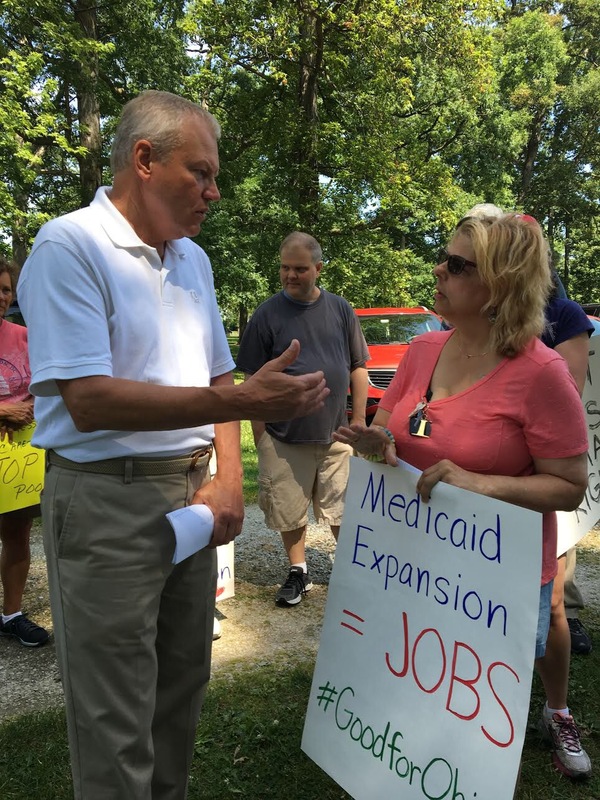 Of the six or seven major construction projects in my hometown of Fremont, Ohio, since Medicaid Expansion, four of them have been healthcare facilities. Construction means jobs, and those new facilities aren’t going to clean themselves, the food isn’t going to cook itself, the supplies aren’t going to manufacture, order and distribute themselves, and the paperwork involved isn’t going to complete and file itself. 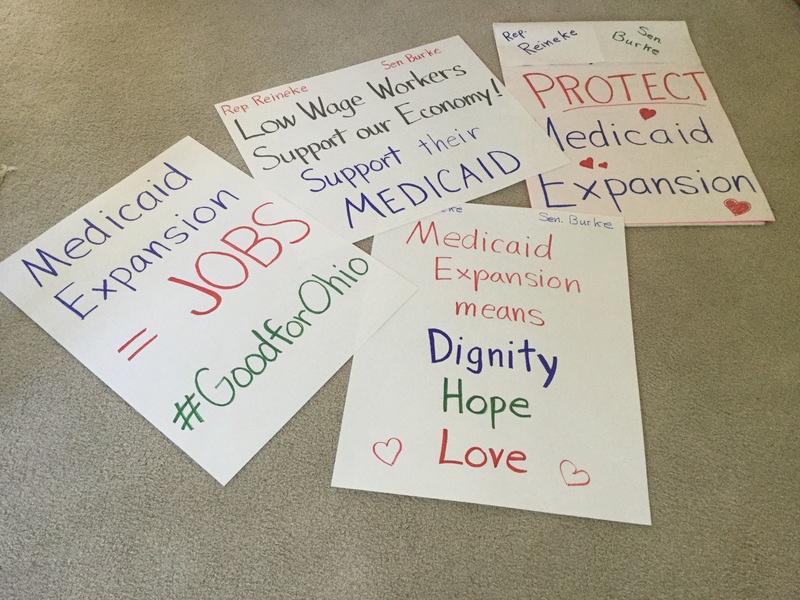 The Ohio House and Senate, for reasons I don’t understand, have passed legislation freezing the Medicaid Expansion. Governor Kasich has expressed a desire to veto this legislation, possibly because he’s noticed all this construction going on. More likely, because he’s a decent human being. If you call his office at 614-466-3555, your call will be recorded, and it will be almost like a vote on the issue, except you can do it from your phone. The meeting will begin with a potluck and open discussion of recent actions. We hope to hear from those who attended science marches this past weekend or participated in other activism/advocacy in the past month. At 7:15 pm, we’ll begin our business/planning meeting. First on the agenda, will be Fair Booth planning for the Aug. 22 – 27 Sandusky County Fair. Fair Booth Chair Elaine Bast will lead the discussion. We will discuss the booth theme and activities, as well as materials and logistics. Next Dave Pasch will introduce a proposal for a city council resolution from World Beyond War. The resolution would endorse moving federal budget spending from militarism into human and environmental needs. Click here to see a sample resolution. One of our PPJ friends suggested that a sanctuary city resolution would be worth pursuing. We’ll discuss this briefly to determine whether any of our membership would be interested in working on this and bringing forward a plan at a future meeting. Here’s what Cincinnati did. And here is an ACLU Freedom City proposal. Announcement: Area activists are hosting an Indivisible Conference- Revitalizing Democracy, May 27, 8:30 am – 2:00 pm, Maumee Indoor Theater. Click here for further info. We welcome newcomers. Hope to see you on Wednesday! Bring signs and tell our community that we care! The non-partisan Congressional Budget Office (CBO) report confirms that the Republican health care proposal would mean up to 24 million Americans losing their health coverage and skyrocketing premiums for older Americans — all to give huge tax breaks to the wealthy and insurance company CEOs. Trumpcare will cut $880 billion from Medicaid, defund Planned Parenthood, and weaken Medicare, reducing the life of the Medicare Trust Fund by four years. The American Medical Association, AARP and Ohio Hospital Association all oppose the House Republicans’ proposal. The president of the statewide hospital group this week told National Public Radio “fully 25 percent of our hospitals in Ohio would be at risk of closure” under Trumpcare. Care for our sick. Protect healthcare for all. We are one people. For more info, call Josie Setzler, 419-559-3759. When Jim Jordan took questions from a crowd at the Harding Home in Marion last week, he told us, “Health care gets better and costs less when Obamacare is gone.” He offered no explanation for how this might happen. Just a few days earlier, Jordan had joined with other House conservatives in the Freedom Caucus to back Rand Paul’s Obamacare Replacement Act (S. 222). What’s in this plan? Does Jordan’s plan make healthcare affordable? The plan offers a $5000 nonrefundable tax credit to every taxpayer, regardless of how the taxpayer gets his/her insurance. Even Jim Jordan, who is provided excellent benefits as a member of Congress, is eligible for this credit. The money must be placed in a health savings account. This nonrefundable tax credit is limited to your tax bill. If you are low income and don’t pay income taxes, you get nothing. For example, a couple with two young children and a family income of $40,000 would owe zero taxes, thus receiving no subsidy to buy health insurance under the plan Jordan endorses. Meanwhile a childless couple earning $150,000 would receive the full tax credit of $5,000 per person ($10,000 total) to place in their Health Savings Accounts. If they are insured through their employers, their out of pocket costs might be far lower than this. Not to worry, however. The Rand Paul plan allows HSA money to pay for lots of upper middle class goodies, like exercise equipment, gym memberships, personal trainers, nutritional supplements, medical concierge services, and more. In the Rand Paul plan, we find a familiar theme: the rich get richer. Meanwhile, many low income workers will lose their healthcare. What about pre-existing conditions? Jordan assured the crowd in Marion that they would be covered. The truth is more complicated. In the first two years of the law, no one would be excluded. After the first two years, however, it’s back to the old rules before Obama’s Affordable Care Act. The Paul plan restores HIPAA pre-existing conditions rules that were enacted in the 90’s. These rules depended on maintaining continuous coverage, and many people had difficulty meeting the conditions. Those anxious times would return under the plan that Jordan endorses. What happens to coverage for maternity care or mental health care? The Paul plan repeals requirements for essential health benefits like these. If a woman is buying an individual health plan and wants maternity coverage, she will pay dearly for it. What about other GOP healthcare plans? Basing tax credits on age instead of income. Penalizing those who experience lapses in coverage. The plan will be worse for people who are poorer and sicker, and better for people who are richer and healthier. According to an analysis commissioned by the National Governors’ Association, millions of people near the poverty line and those with poor health may not receive enough tax credit to afford the coverage they need. This graph from the Kaiser Family Foundation shows the difference between the Obamacare income-based tax credits and the proposed age-based tax credits. Notice that the Obamacare credits shown in dark blue are larger at the low income side of the diagram, while the Republican plan credits shown in gold are uniform across all three income levels shown. The Republican plan gives the same tax credit to everyone regardless of his or her need. Because the subsidies are not means-tested, they are likely to increase the deficit above and beyond Obamacare costs. Yet the plan will not expand coverage, since credits are being given to people who can afford coverage without them. What values shall we embrace? Obamacare was developed as an answer to Americans’ concerns about people who couldn’t afford healthcare. We value taking care of the most vulnerable among us: children, low income workers, the poor, sick, and aging. Meanwhile Republicans like Jim Jordan are reluctant to provide that help. They agonize over creating new “entitlements.” Rand Paul says he favors a smaller tax credit that “not everyone” would get. Not everyone, indeed. Republicans apparently regard healthcare as a privilege, not a human right. That’s why they seem to be ok with denying healthcare to many people who provide assistance for their daily lives, like the folks who serve them coffee at the fast food drive thru, the waitress who brings them their lunch, or the janitor who cleans their office. In Republican eyes, it would seem that healthcare is a ‘privilege’ these people have not earned. Many Americans beg to differ. If Republicans are unwilling to honor these rights through the Affordable Care Act, then I suggest they check out a bill sponsored by Rep. John Conyers along with 61 cosponsors, H.R. 676 Expanded and Improved Medicare for All Act. Learn more about the cost-effective and humane single payer approach to healthcare from SPAN-Ohio. As Martin Luther King, Jr. said generations ago, “Of all the forms of inequality, injustice in health care is the most shocking and inhumane.” The moment is urgent; we must speak out now to defend healthcare for all Americans. Note: Rep. Jim Jordan’s constituents in Ohio District 4 have an opportunity to speak up at Jordan’s Norwalk office on March 7 at 11 am. Join us for this demonstration and meeting with Jordan’s aide. Read more and RSVP here.